If you ask any security professional what the first line of defense is in a security system they will tell you the perimeter. Plus, any overall security system worth its salt will be layered, starting with the perimeter and continuing through layers to the most inner and valuable areas of the facility and personnel that reside within. This concept receives even more public attention as authorities discuss how to harden the security at our schools and other institutions of learning every time tragedy strikes. Let’s look at some of the practices, products and procedures when implementing perimeter security, which many consider the most challenging application of both physical and electronics security devices. A perimeter can be anything from the edges of an entire country, a seaport, an oil refinery, a school, a small business and a home. While planning a good perimeter system one should always remember the six D’s — deter, detect, dispatch, delay, deny and defend. The best thing you can do to an intruder, or should I say a potential intruder, is to deter them from even thinking of further penetration into the facility. This can start with simple measures such as the presence of warning signs, audio announcements, lighting, guard dogs, robots and fences topped with razor ribbon. Another popular physical security method being used more often due to terrorist threats are bollards on perimeter access points. 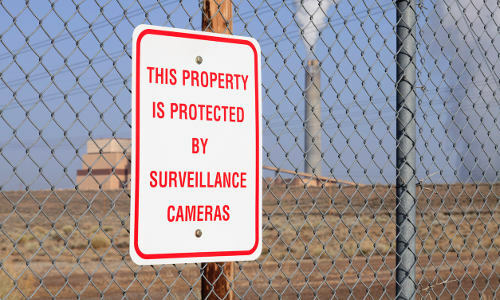 These devices provide a strong deterrent to unauthorized traffic. Perimeter alarm sensors come many flavors for detecting an attempted intrusion in progress. Sensors can be placed directly on the perimeter fence. One of the latest systems is the G-FENCE 3000 system from Protech. Intelligent processing distinguishes between environmental conditions such as wind and rain, and attempts to climb or cut fence. Another perimeter detection system is the SR-500/1000 radar detection system from Magos Systems. This is especially cost effective for large perimeter areas as the radar detectors have a range of roughly 1,300 feet for a walker and 2,000 feet for vehicle/boat. The manufacturer boasts an ultra-high resolution range of 1.3 feet, giving it excellent performance in in cluttered environments. Another popular tool is the use of CCTV with video analytics to detect anomalies in the perimeter area. It’s important to have motion detection mainly focused inside the fenced perimeter to help reduce false alarms from the detection of animals and non-threatening personnel outside the physical perimeter. Instead of a specific tool, this month I’m sticking to the “D” theme and addressing drones. In the past when I wanted to propose a particular perimeter CCTV camera view to a potential customer I would temporarily place a camera high up on the end of a telescopic pole; today the same results can be done with a drone. We’ve also used Google maps to survey a large perimeter system proposal; this too can be done efficiently, accurately and economically with a drone and camera. Also, lately I’ve noticed several companies leveraging drones to help in equipment support, thereby saving the cost of extra personnel or expensive equipment rentals. Once an intruder has been detected on the perimeter a proper security response is needed. This can be notification of local police by the central monitoring station or notifying onsite guard services. 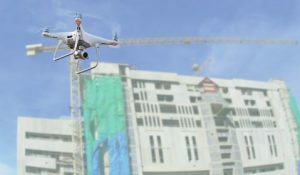 In an effort to reduce cost and risk, automated response with drones (see Tool Tip) and guard robots is becoming more accepted. A drone can quickly be dispatched to a large perimeter area to help verify and identify a suspected intrusion. Extra measures can be taken in an effort to delay the progress of an intruder through the many layers of security. One example is to implement a double fence line by which the intruder has to fight their way through multiple obstacles. Another more intimate delay example would be the use of a man-trap entrance in which two doors have to be accessed via verification of proper credentials. Every effort must be made to deny the intruder further entrance. This can happen at many points in the layered system. It can be extra walls, doors or one-way access controlled gates. A very good reference for more ideas and information on physical perimeter security recommendations is the “Site and Urban Design of Security: Guidance against Potential Terrorist Attacks, FEMA 430.” It’s a free 272-page comprehensive risk management document loaded with security examples and illustrations. At any point in the layered security system the owner and authorized personnel should be ready to defend the facility and its personnel. It is the goal of all the other physical and electronic security measures to avoid a serious confrontation. However, first-responder personnel should be trained and ready for prompt action. 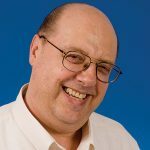 Bob is currently a Security Sales & Integration “Tech Talk” columnist and a contributing technical writer. Bob installed his first DIY home intercom system at the age of 13, and formally started his technology career as a Navy communication electronics technician during the Vietnam War. He then attended the Milwaukee School of Engineering and went on to complete a Security Management program at Milwaukee Area Technical College. Since 1976, Bob has served in a variety of technical, training and project management positions with organizations such ADT, Rollins, National Guardian, Lockheed Martin, American Alarm Supply, Sonitrol and Ingersoll Rand. Early in his career, Bob started and operated his own alarm dealership. He has also served as treasurer of the Wisconsin Burglar and Fire Alarm Association and on Security Industry Association (SIA) standards committees. Bob also provides media and training consulting to the security industry.